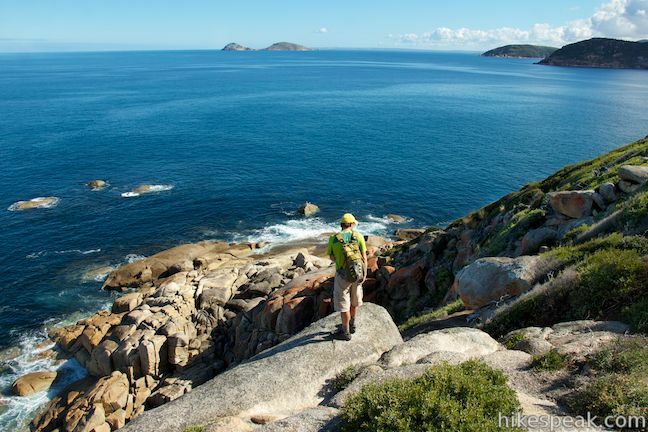 Wilsons Promontory is the southernmost point on Mainland Australia and it stands out in other ways too, with coastal beauty that’s hard to beat. 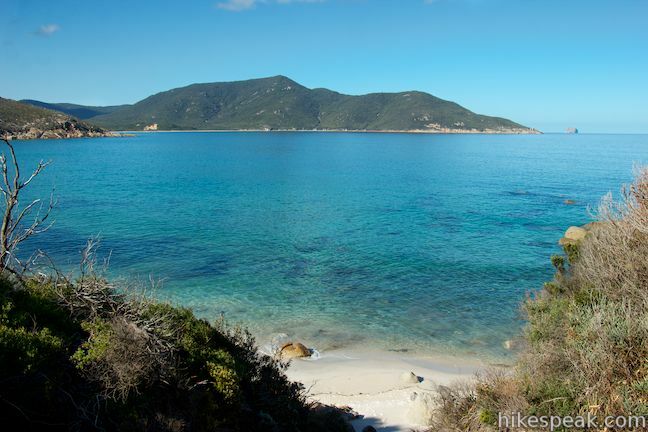 See what the Prom has to offer on this day hike across a boulder-strewn point between bays of clear turquoise water with pale sand beaches. 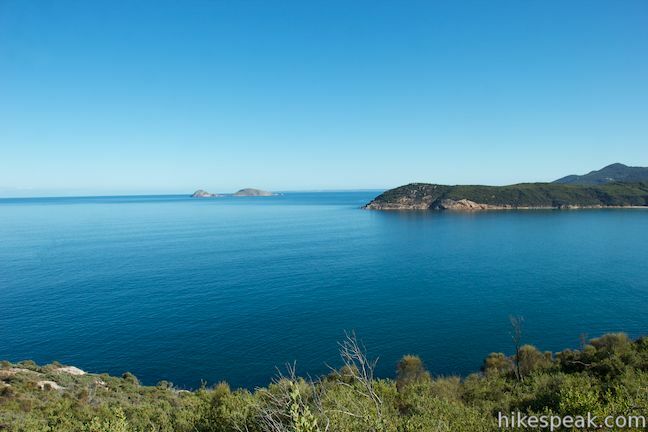 There are ocean and mountain views to enjoy at every turn of this walk as it takes you from the park’s main hub at Tidal River to the south end of Norman Beach and then across Norman Point to Little Oberon Bay. 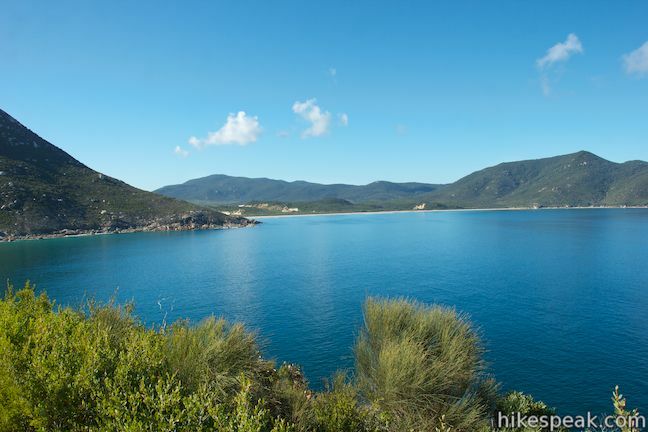 This basic distance of this hike is 8 kilometers (5 miles) round trip with 70 mild meters of elevation gain. 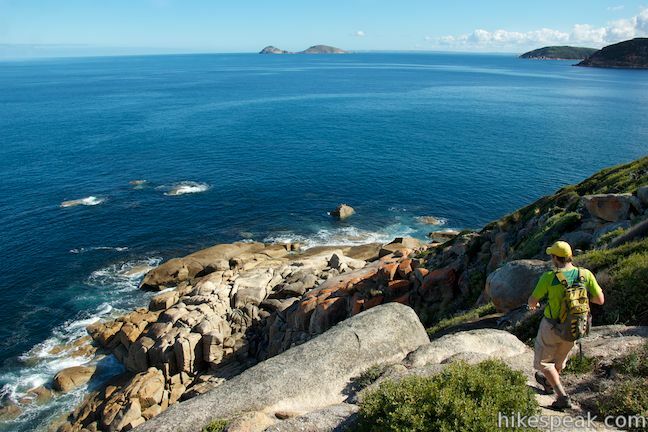 However, you will likely want to go a bit farther, walking to the end of the beach at Little Oberon Bay and out a side trail to the end of Norman Point for a 9.5-kilometer (5.9-mile) round trip return hike in Wilsons Promontory National Park. 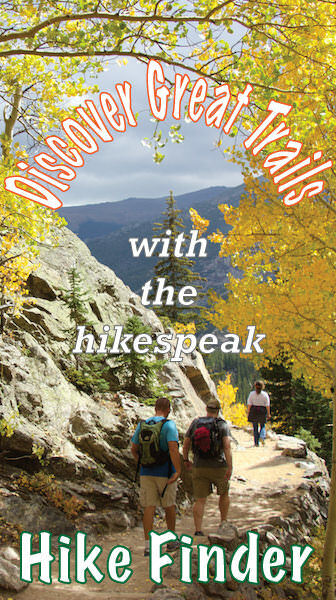 There are a couple options to consider before setting out on this hike. 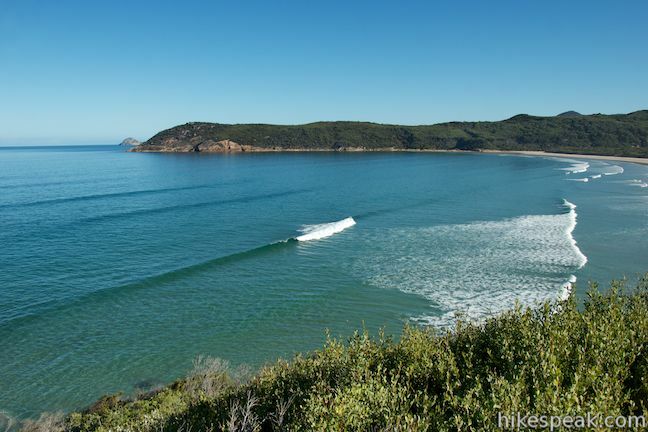 First off, two roughly equal length routes lead from Tidal River to the south end of Norman Beach. 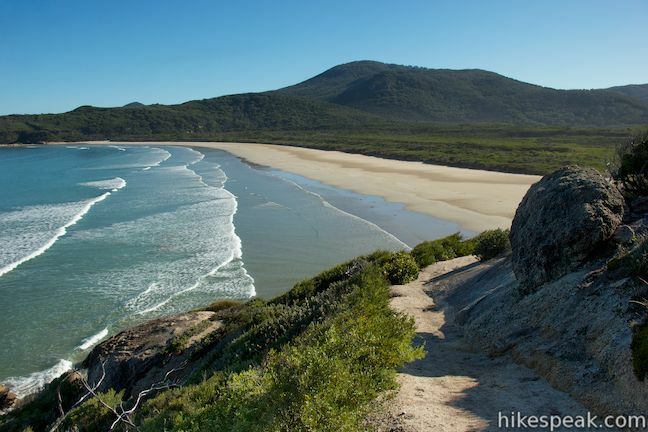 The most obvious route is South Norman Bay Track (the opening leg of Oberon Bay Track), which crosses a low hill between the visitor center and the beach. 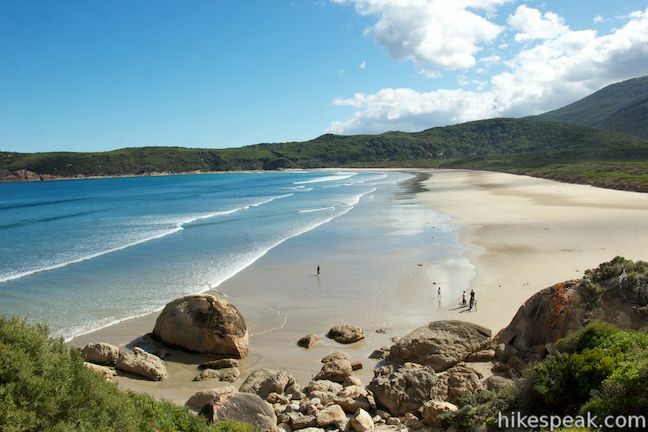 You can also make your way there by walking through the campground to the top of Norman Beach and then stroll down the open beach to meet up with South Norman Bay Track. 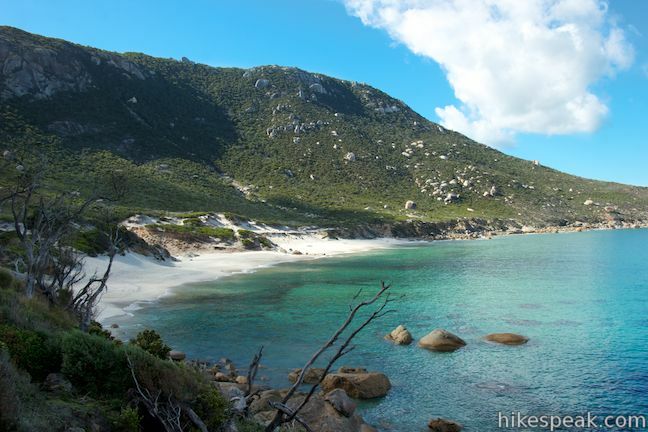 This pleasant alternative will allow you to increase your time on the beach and potentially add a loop to the beginning of this otherwise out and back hike. 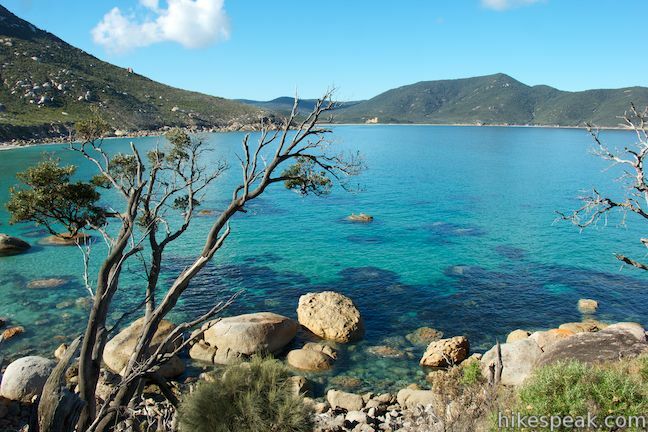 Past Norman Beach, on the way to Little Oberon Bay, a short side trail goes out to the end of Norman Point, the peninsula separating Norman Bay from Little Oberon Bay. 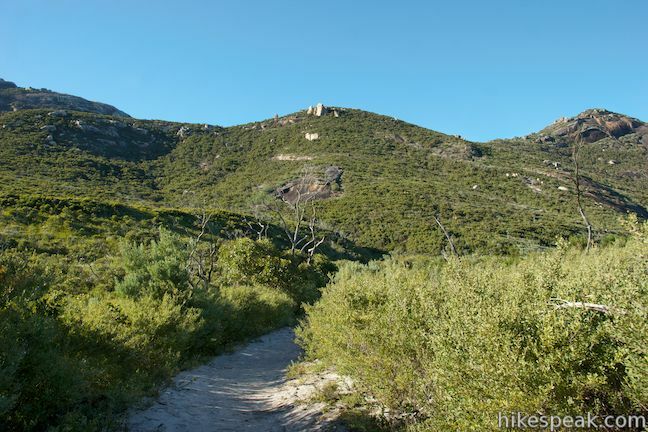 This spur trail is 350 meters long one way. 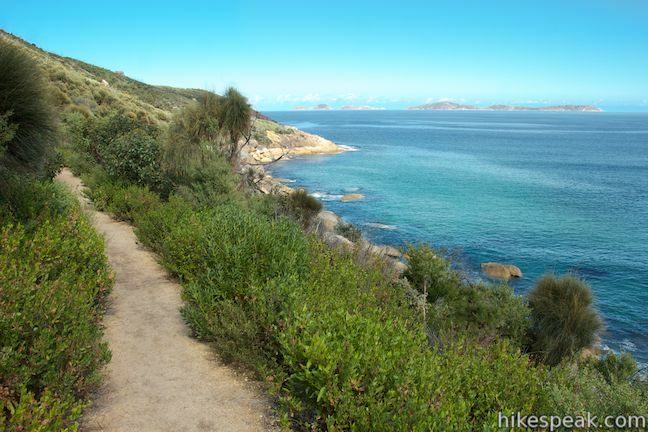 Excluding this side trail, it is 8 kilometers round trip from Tidal River Campground to the edge of the beach at Little Oberon Bay. 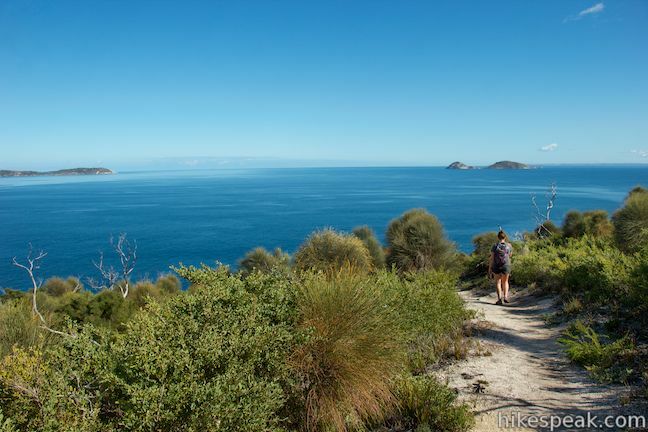 Once you’re there, you can stroll 400 meters along the beach to a spot where the trail continues to Oberon Bay, bringing the total distance for the hike up to 8.8 kilometers (or 9.5 kilometers round trip with the side trail to Norman Point). 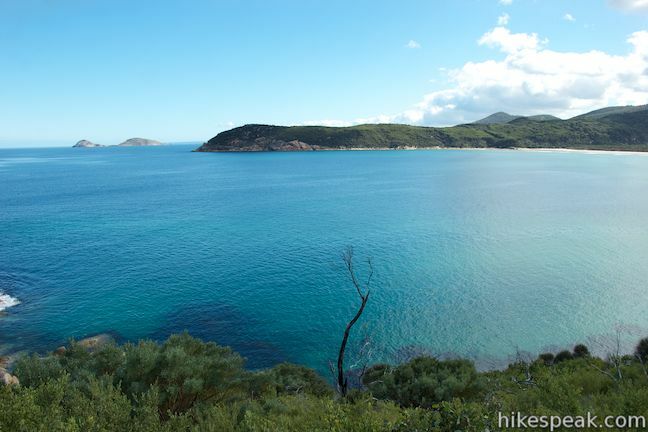 For those looking for a longer day hike, it is an additional two kilometers from the end of the beach at Little Oberon Bay to Oberon Bay. 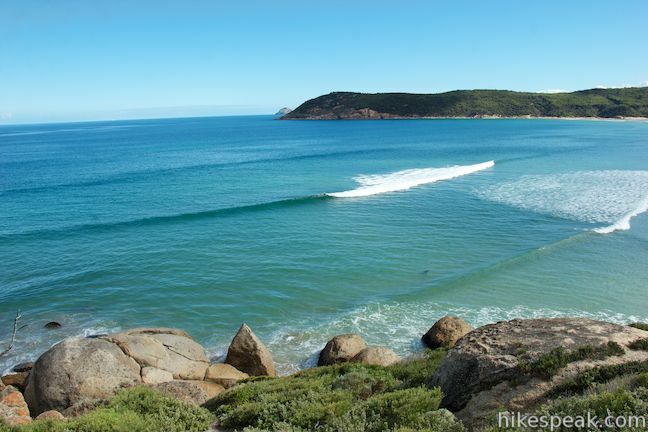 If you aren’t staying at one of the 484 sites at Tidal River Campground, park in the large day use parking area across from the Tidal River Visitor Centre. Just past the visitor center you’ll spot a general store and cafe. Set back from the road between these two are the Terrace Block Bathrooms. The trail starts to the left of the bathrooms. Hike up this wide dirt track, which curves uphill behind the bathrooms and comes immediately to a junction after 100 meters. The junction is marked by a sign with arrows pointing to the left toward Oberon Bay and Norman Bay South. 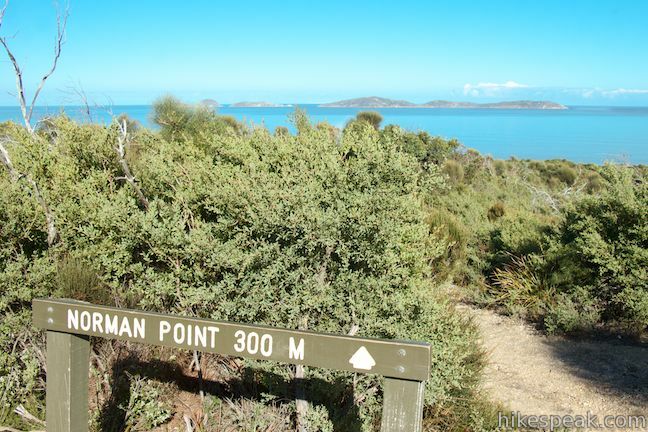 Turn this way to take South Norman Bay Track for the first leg of the hike. 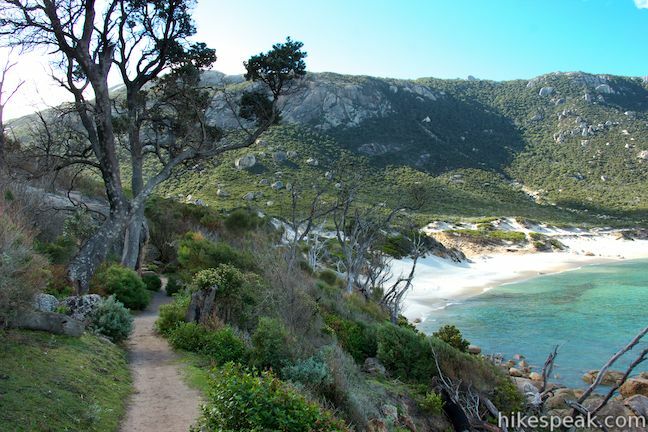 To the right, another track (marked with a sign and an arrow for 20th Avenue) descends toward a coastal area of Tidal River Campground. 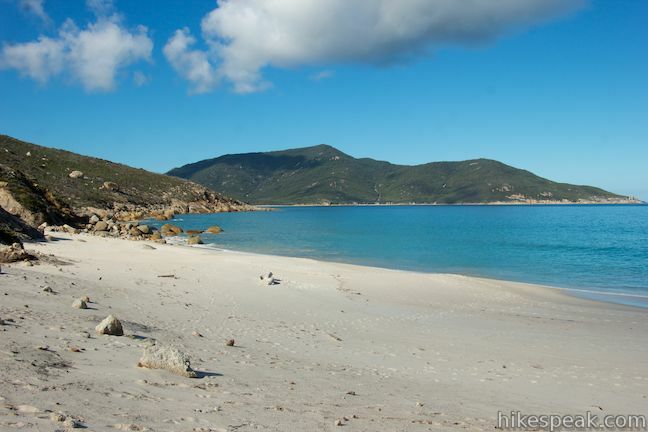 Take this route if you would rather start your hike with a stroll in the sand down Norman Beach. Alternate route: The directions through the campground and down the beach are simple. Take the walking track down the other side of the hill to the crosswalk across Ring Road. Walk around the Beach Block Bathrooms to the Fourth Ramp access path to Norman Beach. 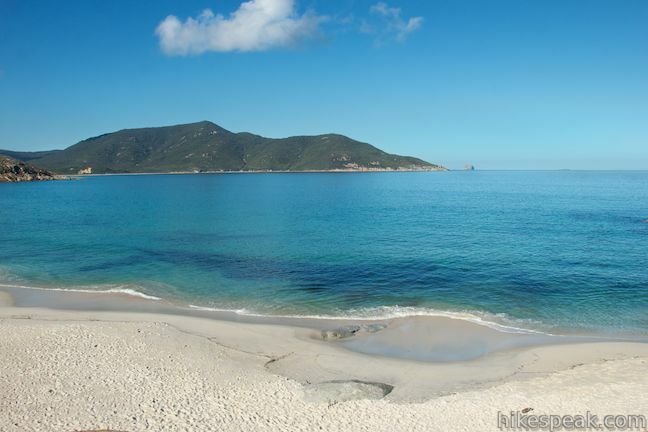 When you reach the sand, turn left and walk down to the south end of the beach. 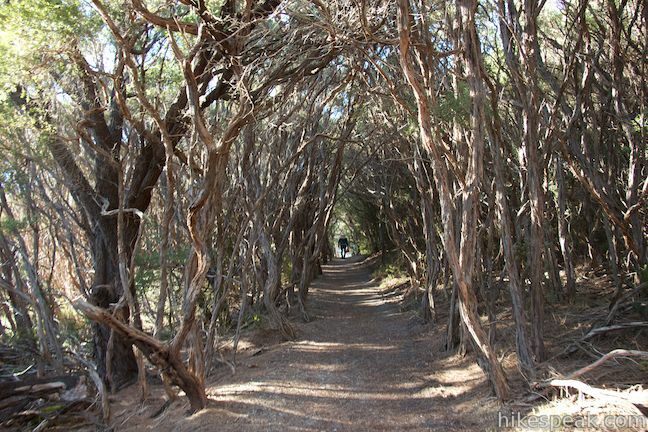 Main route: South Norman Bay Track continues across the top of the hill through a grove of tea trees that arch over the trail like a natural pergola, providing some of the hike’s only substantial shade. 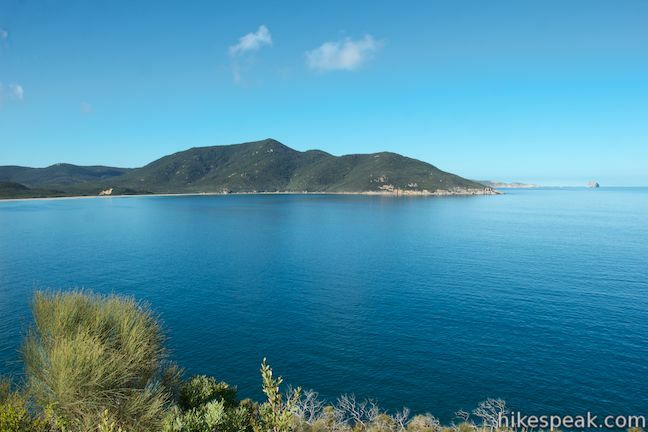 Along the way, there are a couple small views of Norman Bay, but the better views are yet to come. Cross Ring Road at 0.45 kilometers from the start and continue up the trail on the other side. 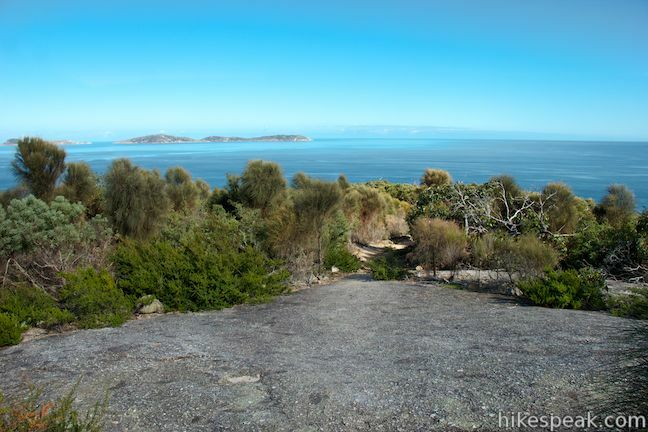 As you pass through low brush, there will be straight-on views of Mount Oberon, a 558-meter (1,830-foot) summit of granite and greens that rises above this coastal hike. 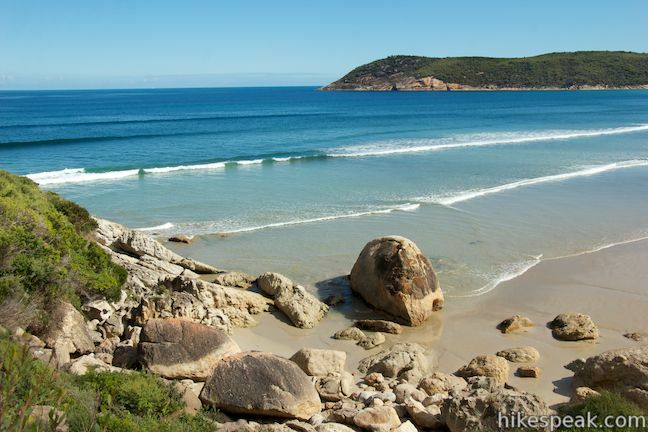 After hiking for just over one and a half kilometers, either down South Norman Bay Track or through the campground and down Norman Beach, you will reach to the south end of Norman Beach where there is large wooden sign alongside the trail to Norman Point and Little Oberon Bay. 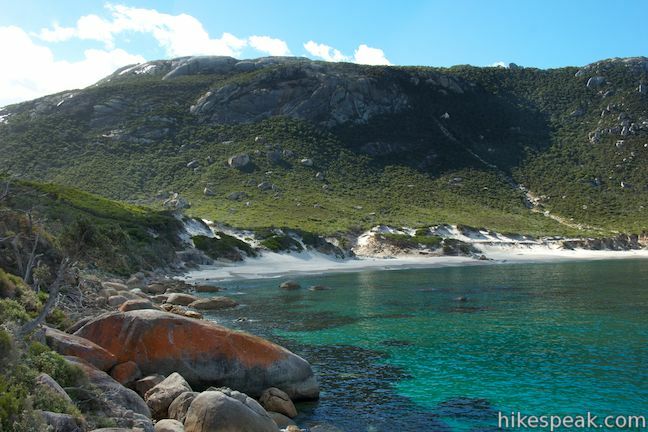 If you came via South Norman Bay Track, you’ll probably be enticed to step off the trail and check out the beach first. 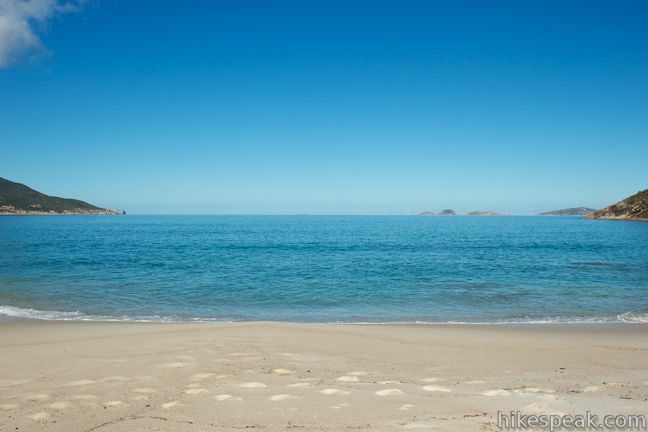 The beach is long, wide, and fairly level. 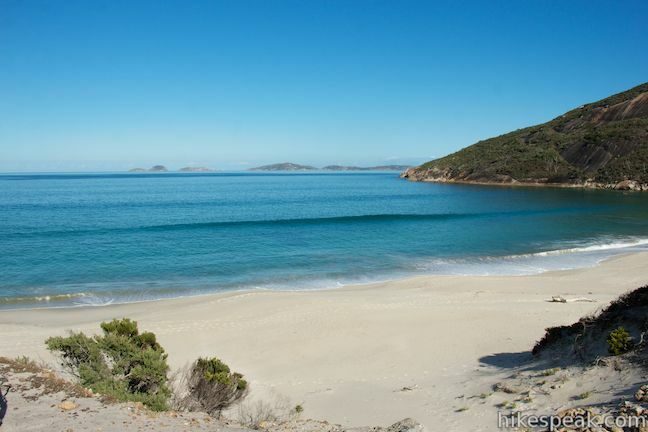 Surfing is allowed at the south end of the beach and there are desirable places to walk, jog, and picnic throughout. 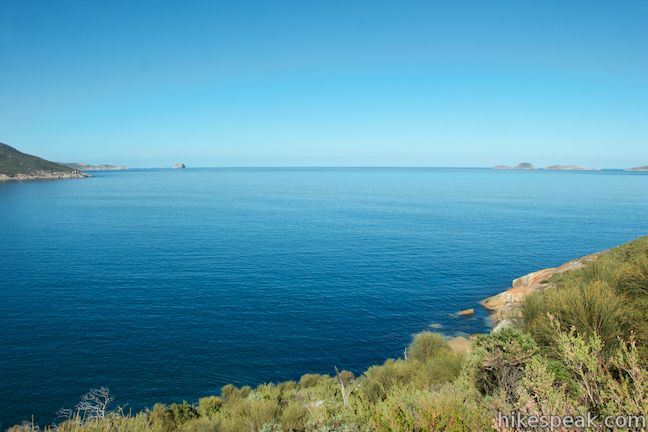 Norman Bay is framed to the north and south by rocky points. 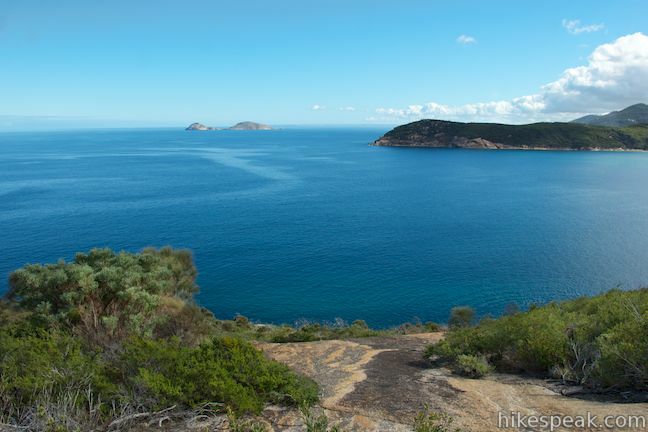 As you look west, you’ll spot the Glennie Islands, a chain of undeveloped islands about ten kilometers off shore. 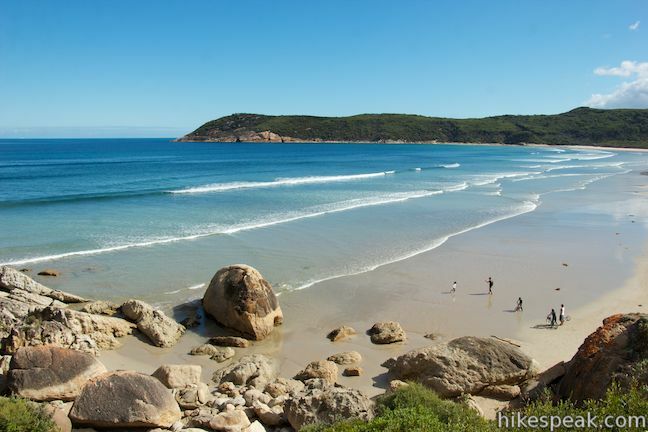 Sure you could spend all day at Norman Beach, but there’s a nicer smaller beach just around the point, so keep on hiking to Little Oberon Bay. Oberon Bay Trail heads gradually uphill toward Norman Point, the cape separating Norman Bay from Little Oberon Bay. 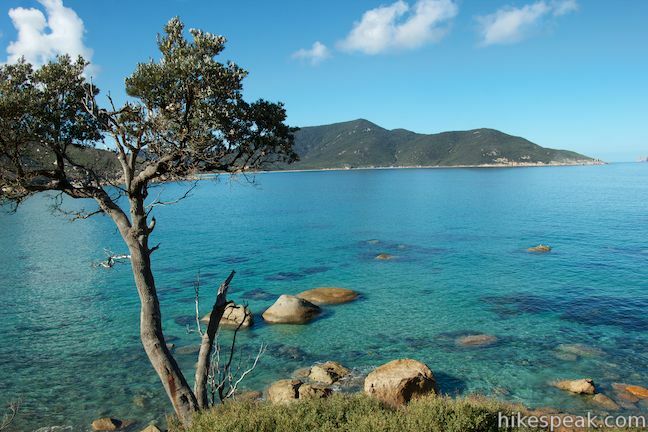 As you hike, there are beautiful open views up Norman Beach and out across the bay toward the Glennie Islands. 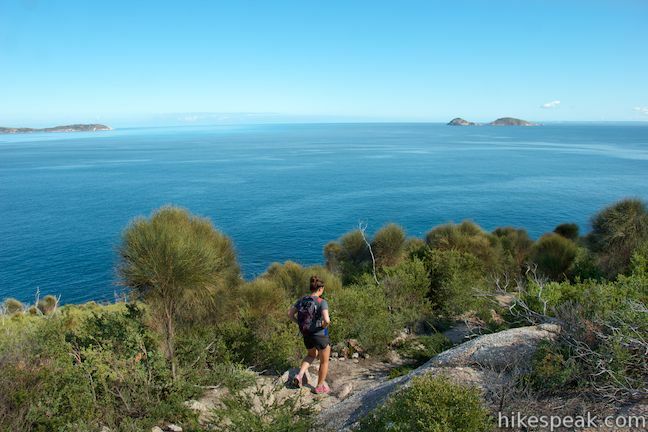 The trail easily tackles 70 meters of elevation gain over the next 1.45 kilometers. 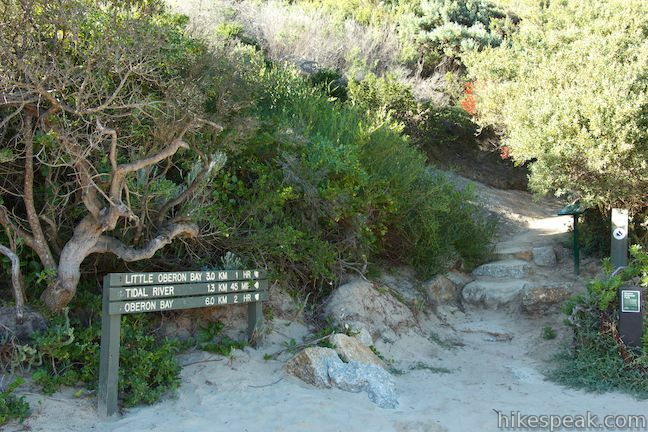 There are stone steps along the dirt trail as well as a bit of boardwalk and concrete to make things easy as you progress up and out to the end of the point. At 3 kilometers from the start of the hike, you will come to a junction at a crest in the trail. 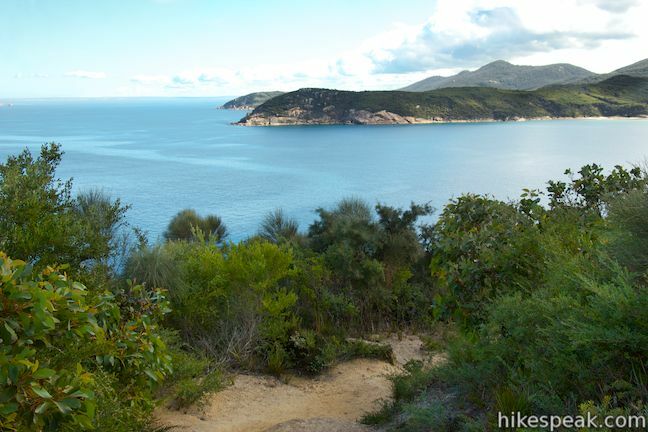 This is the highest point of the hike, so it is mostly downhill to Little Oberon Bay. 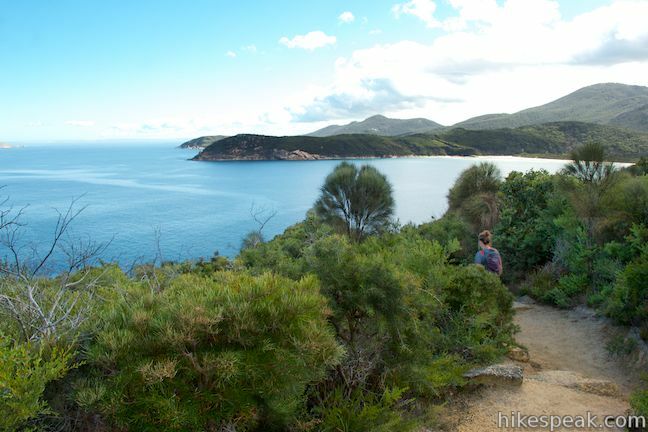 Before continuing another kilometer to the beach at Little Oberon Bay, you can take a short spur trail to the right out to the end of Norman Point. 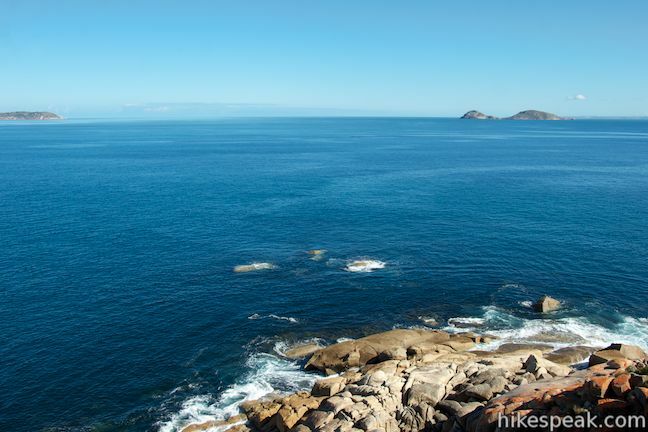 Norman Point Trail descends approximately 45 meters over 1/3 of a kilometer, and while this is the steepest part of the hike, the elevation change is pretty manageable as the rewarding side trail leads to panoramic ocean views. 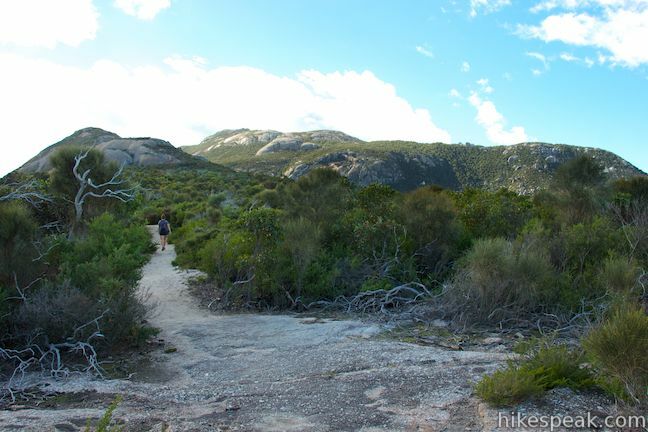 The trail travels downhill over granite bedrock lined by low brush. The end of the trail isn’t marked, but you’ll know when you’ve reached it because you’ll run out of land. 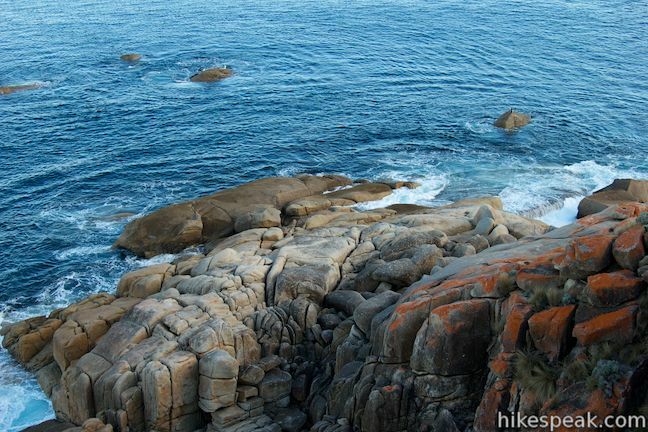 Carefully take in the view from atop the steep shelf, which drops to the ocean at the end of the point. 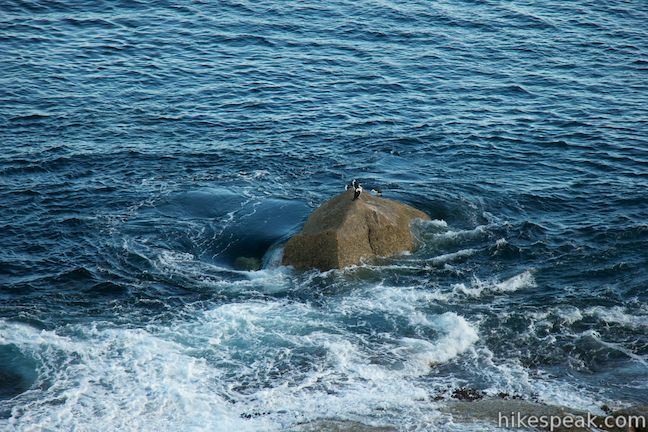 Below, dark blue waves crash into the boulders that jut into the surf. Some of the rocks are painted orange to add extra color to the scene. 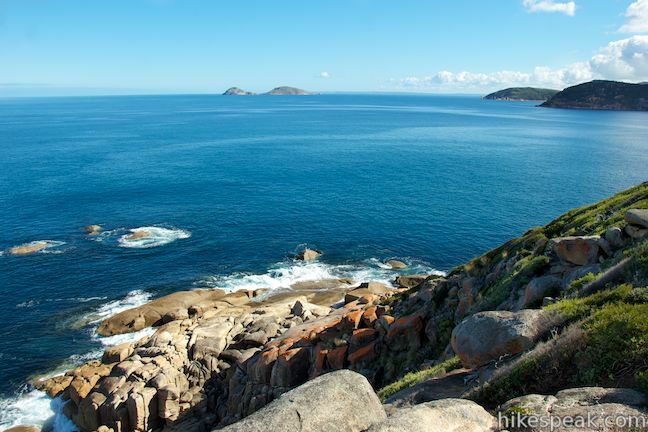 From Norman Point you can take another look north across Norman Bay and also look south across Oberon Bay toward the land at the south end of Wilsons Promontory, the southernmost place in Mainland Australia. 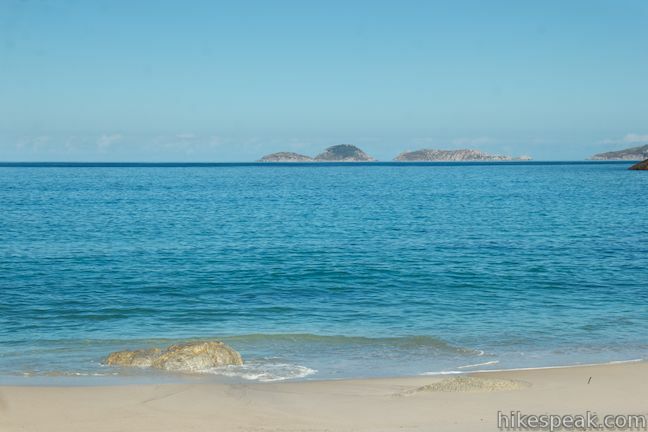 Anser Islands and a few smaller islands are also visible to the south beyond the coastline. 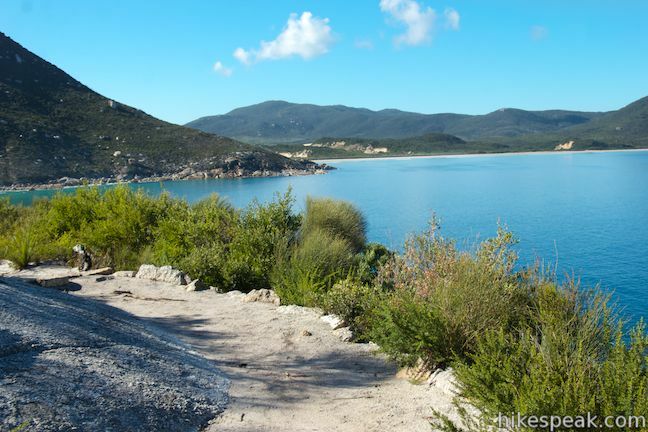 As you hike back up Norman Point Trail, you will have views inland of the granite peaks surrounding Mount Oberon. 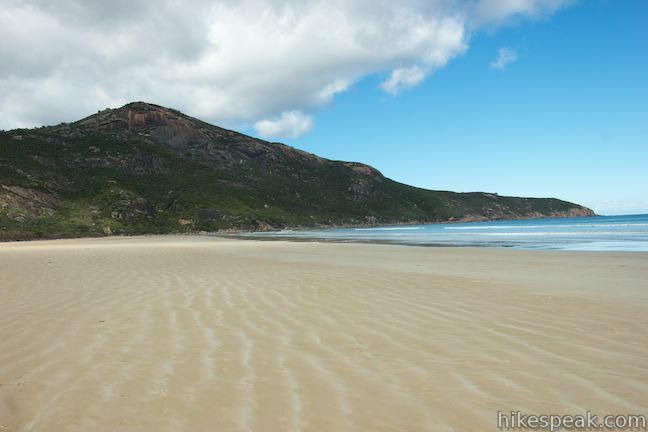 Upon returning to Oberon Bay Track, turn right to continue to Little Oberon Bay. 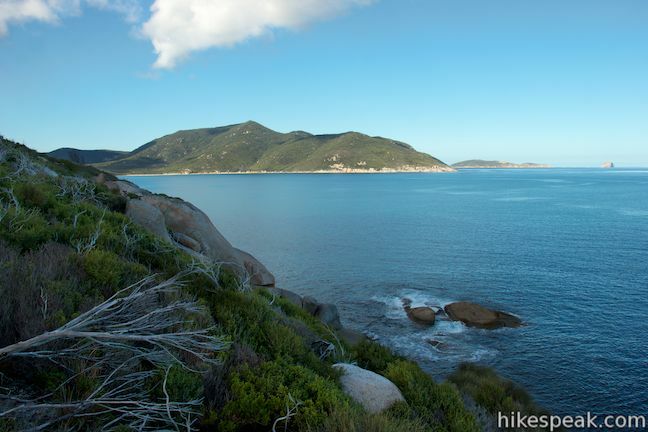 After Norman Point Junction, the trail turns downhill toward the next pair of bays. 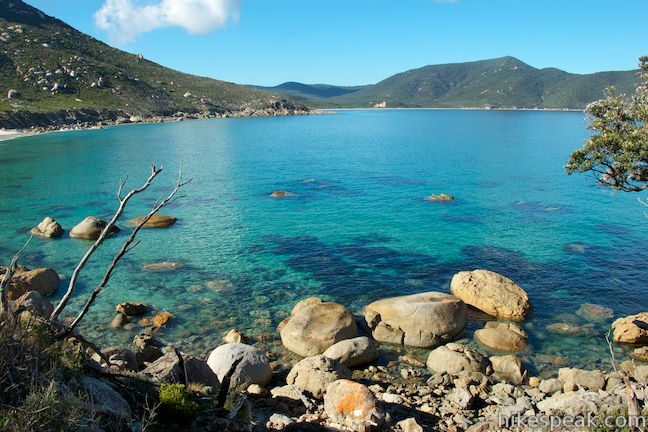 As you hike through the boulders and brush, you’ll soon get views south across a wide bay, which is actually two bays, Oberon Bay and Little Oberon Bay, each with its own sandy beach separated by a modest rocky protrusion. 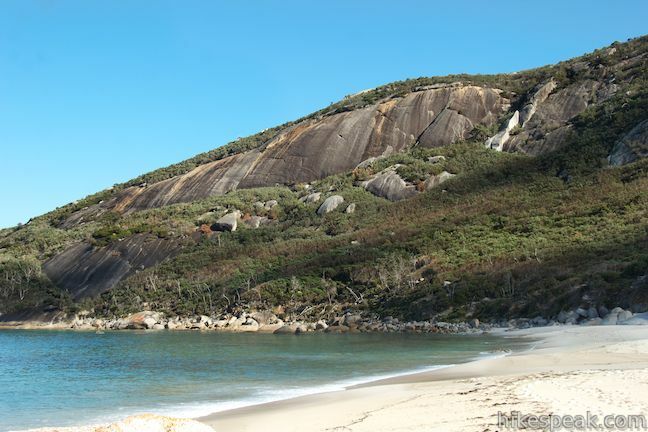 Granite mountains covered in green brush form a crescent-shaped backdrop around the lovely bays. 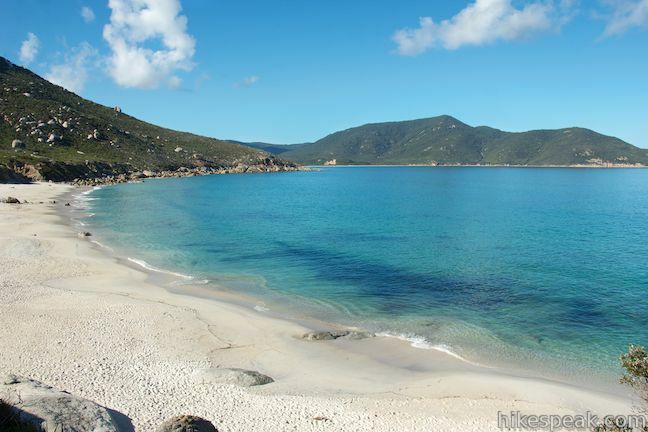 Little Oberon Bay has the closer and smaller of the two beaches. 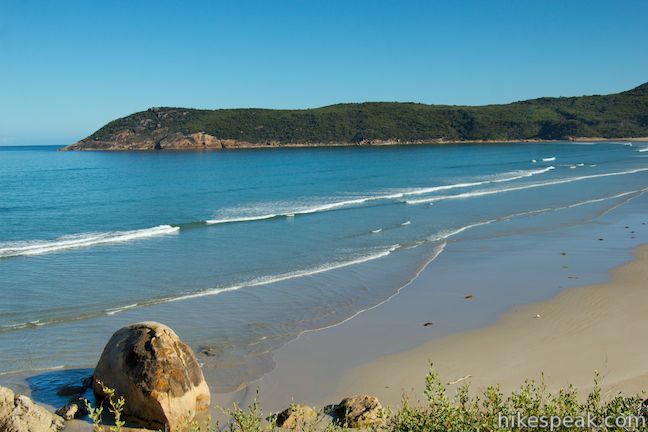 As the trail curves inland along the south side of Norman Point, you’ll see that the beach at Little Oberon Bay is backed by short cliffs and wind-swept sand dunes. 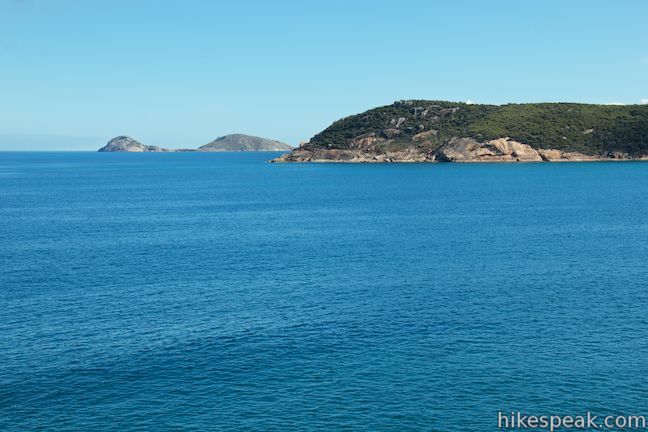 Below the trail, beneath a few steep drop offs, you’ll see turquoise water clear enough to make out every detail on the bottom of the bay. 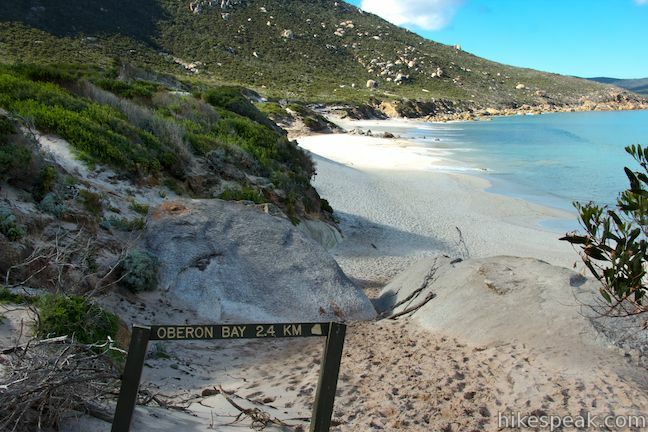 Several steps lie in your way in order to leave the point for Little Oberon Bay. 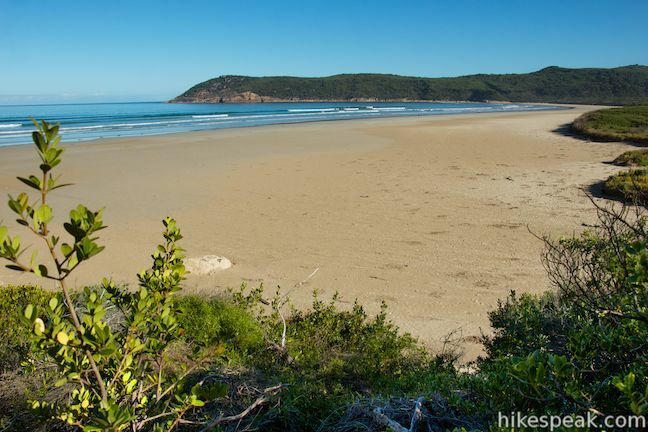 A kilometer from the junction on Norman Point, and 4 kilometers from the start (excluding the side trail), you will come to the edge of the beach at Little Oberon Bay. 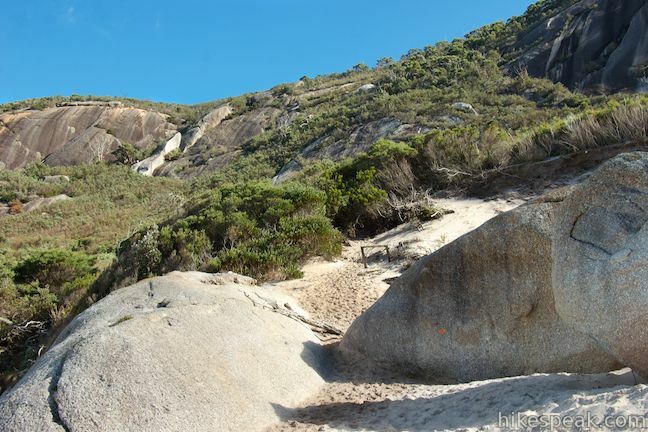 Scurry down a slope of sand wedged between large boulders to reach the beach’s firm sand. 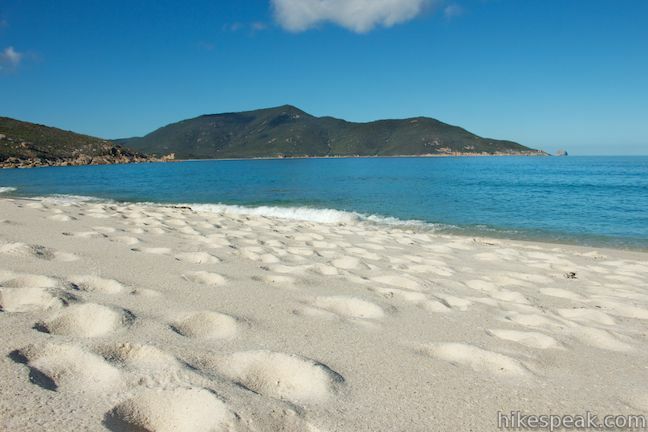 If the beach appears to shimmer underfoot, that’s because there are grains of clear quartz crystals in the sand, making the beach look especially white. 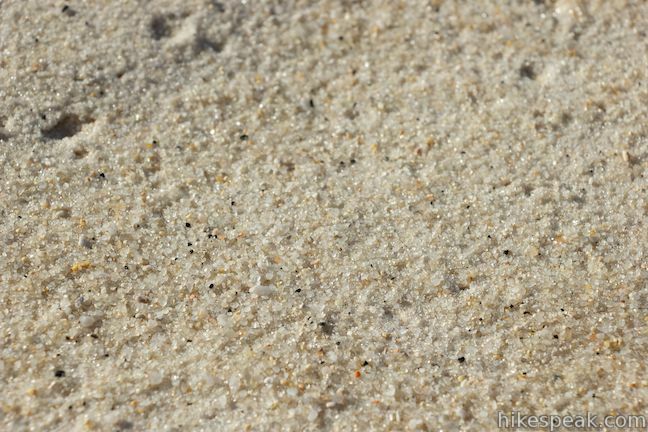 Your feet may make a squeaking sound as you walk around, which is also a result of the quartz sand. 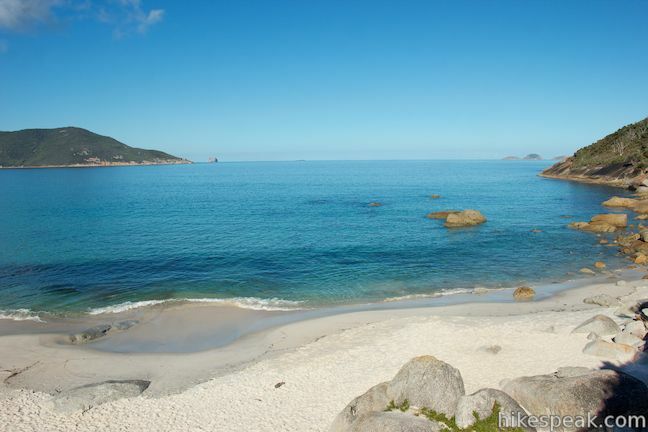 The beach is broken up by a few boulders that make good perches for resting your legs and taking in the scene. 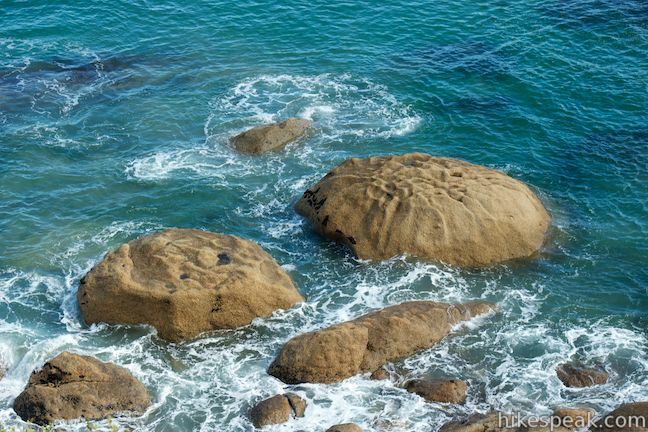 If the tide is coming in, you can watch the water encircle more and more of the boulders. 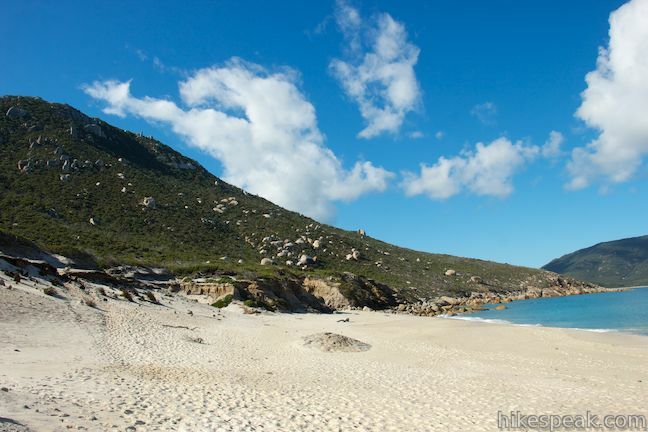 The beautiful and relatively private beach is a perfect place on the Prom to linger and have a snack or picnic. 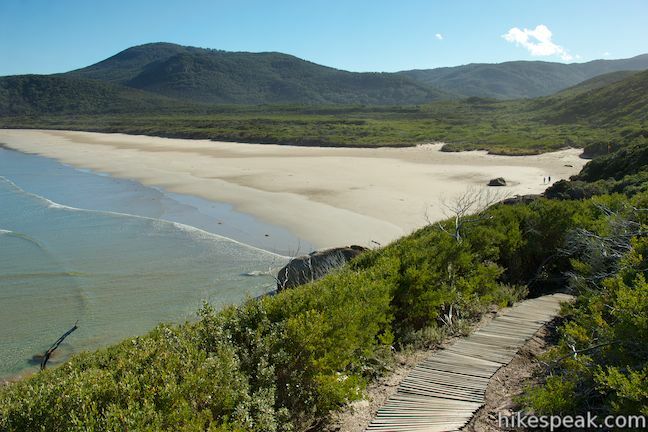 After 400 kilometers in the sand, the trail continues beyond the south end of the beach toward Oberon Bay. 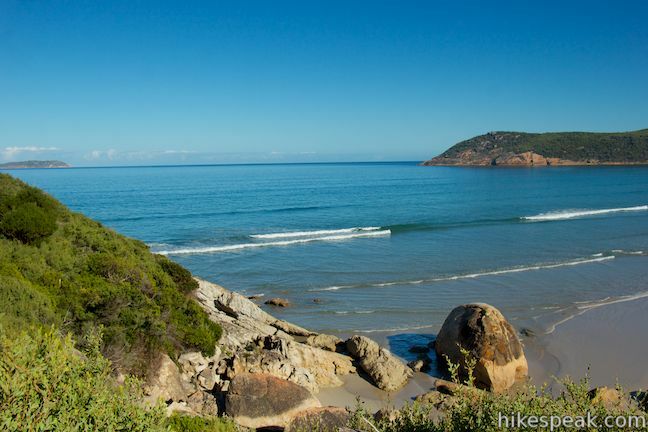 The well-worn track goes up onto a sandy shelf behind the beach and returns to a terrain of boulders and brush, where you’ll spot a trail sign listing the distance to Oberon Bay as two kilometers. Turn around here for an 8.8 kilometer round trip return hike (9.5 km including the side trail to Norman Point). Dogs and bikes are not permitted. 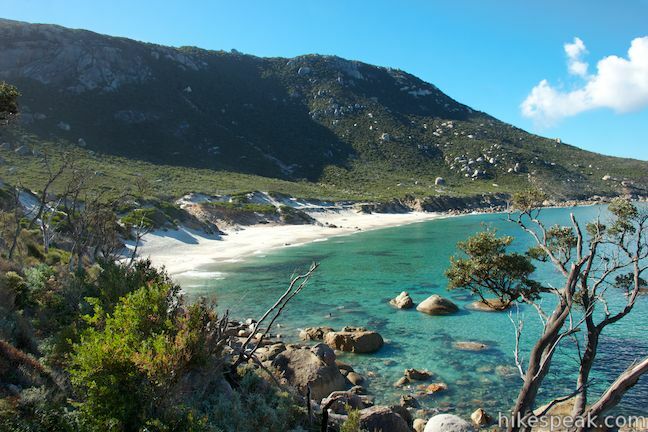 There is no entrance fee to visit Wilsons Promontory National Parks for the day, but there is a fee to stay overnight at the campground or other accommodations. 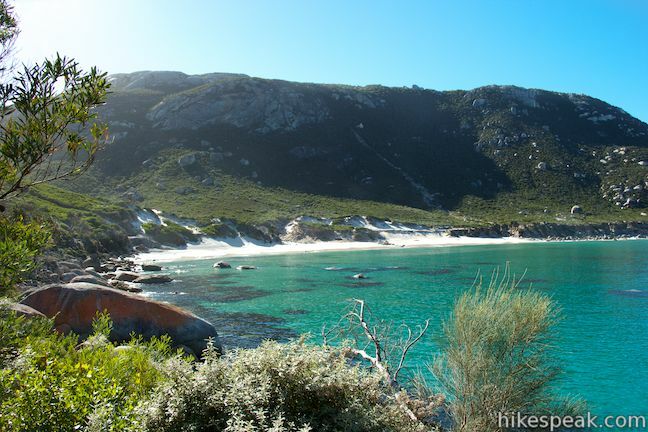 No permit is required to hike to Little Oberon Bay, so get out and enjoy! Directions: From Melbourne, take M1 east for approximately 55 kilometers to the exit for C422. Turn south at the end of the ramp onto Healesville – Koo Wee Rup Road (C422). After 13.5 kilometers, when you reach the town of Koo Wee Rup, make a right onto Rossiter Road, followed immediately by a left on Sybella Avenue to stay on C422. Drive 1.8 kilometers and turn left onto M420. 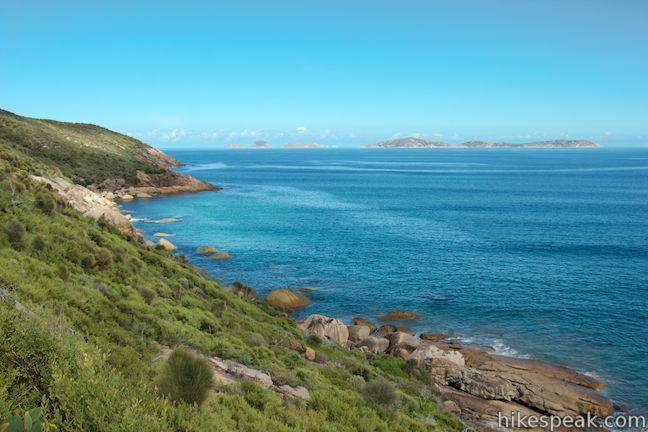 After 10.6 km, turn left onto A440 following signs for Wilsons Promontory. 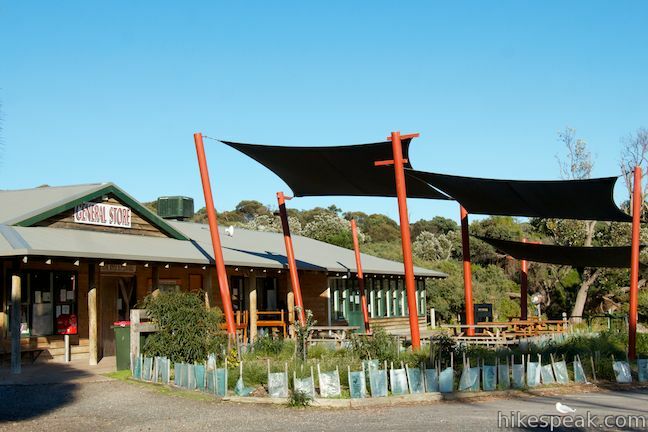 Stay on A440 for 46.8 kilometers to the town of Leongatha where you’ll make a right followed by an immediate left at the first roundabout to continue on A440. Drive 17.6 kilometers and turn right on C444 (Meeniyan-Promontory Road). 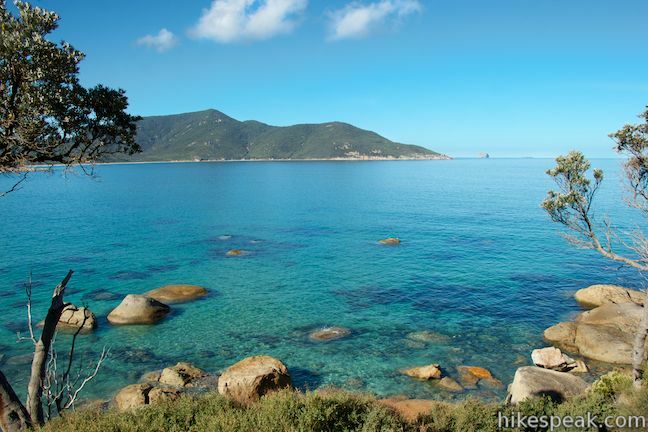 After another 17 kilometers, pass through the town of Fish Creek and turn right to continue on Meeniyan-Promontory Road. 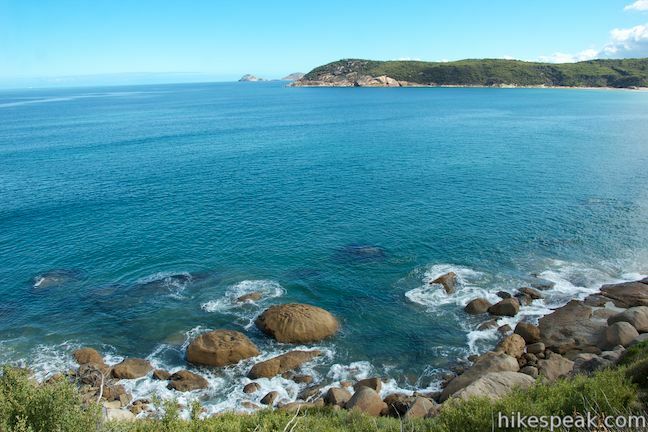 Stay on this road for 54 kilometers to reach Tidal River, which is 29.5 kilometers pass the park entrance. 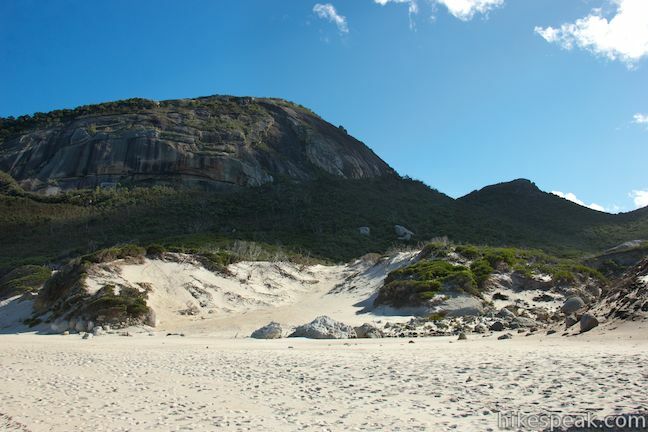 At the end of Wilsons Promontory Road (C444), make two right turns to reach the visitor center where you can park in the car park on the right before the entrance of the campground. 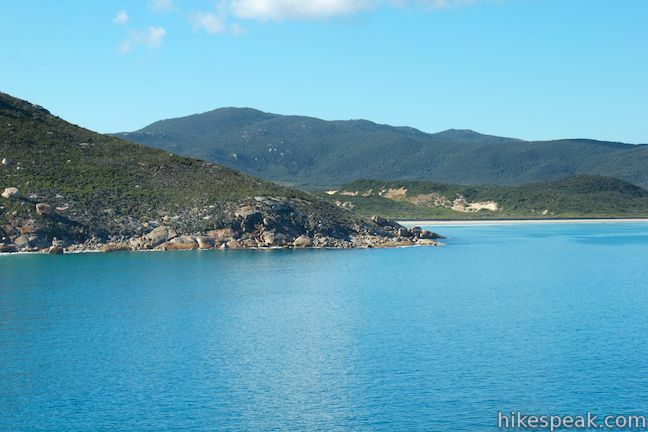 Or view a regional map of surrounding Australian trails, campgrounds, and lodging. These photos were taken in April of 2014. Click to enlarge. 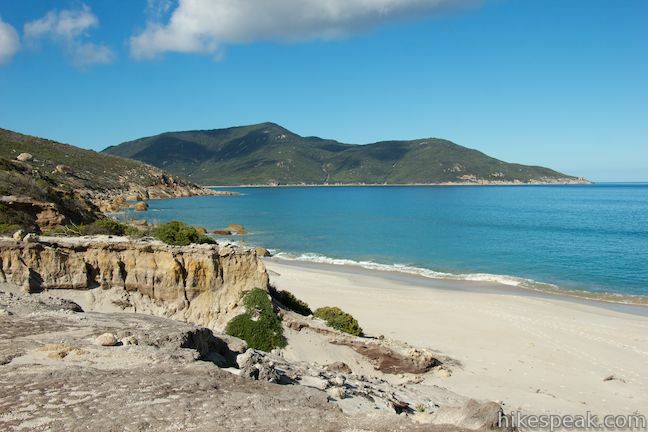 This 484-site campground is the major camping facility within Wilsons Promontory National Park, the coastal paradise at the southernmost point of Mainland Australia.